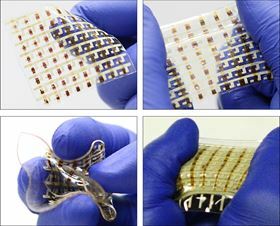 Researchers from the University of Houston have reported significant advances in the field of stretchable, rubbery electronics. Photo: University of Houston. In a paper published in Science Advances, the researchers outlined advances in creating stretchable, rubbery semiconductors, including rubbery integrated electronics, logic circuits and arrayed sensory skins fully based on rubber materials. Cunjiang Yu, assistant professor of mechanical engineering at the University of Houston and corresponding author on the paper, said the work could lead to important advances in smart devices such as robotic skins, implantable bioelectronics and human-machine interfaces. Yu previously reported a breakthrough in semiconductors with instilled mechanical stretchability, much like a rubber band, in 2017. This work, he said, takes the concept further with improved carrier mobility and integrated electronics. "We report fully rubbery integrated electronics from a rubbery semiconductor with a high effective mobility ... obtained by introducing metallic carbon nanotubes into a rubbery semiconductor with organic semiconductor nanofibrils percolated," the researchers wrote. "This enhancement in carrier mobility is enabled by providing fast paths and, therefore, a shortened carrier transport distance." Carrier mobility, or the speed at which electrons can move through a material, is critical for an electronic device to work successfully, because it governs the ability of semiconductor transistors to amplify the current. Previous stretchable semiconductors have been hampered by low carrier mobility, along with complex fabrication requirements. For this work, the researchers discovered that adding minute amounts of metallic carbon nanotubes to the rubbery semiconductor P3HT – polydimethylsiloxane composite – leads to improved carrier mobility by providing what Yu described as ‘a highway’ to speed up the carrier transport across the semiconductor. Future work, Yu said, will involve further raising the carrier mobility, and building more complex hierarchy and high level integrated digital circuits to meet the requirements for integrated circuits, as well as biomedical and other applications. This story is adapted from material from the University of Houston, with editorial changes made by Materials Today. The views expressed in this article do not necessarily represent those of Elsevier. Link to original source. Scientists have shown that films of carbon nanotubes can effectively stop dendrites from growing from the anodes in lithium-metal batteries.